Wise people say that health is the greatest blessing anyone can ever enjoy. Even if you’re wealthy, famous and worshiped, life may appear to be a curse if you have poor health. Hence, countless studies are being done on how to improve one’s health. While others focus on the right nutrition and the avoidance of unhealthy habits, some researchers look into how emotions affect our health, especially happiness. After countless researches and experiments, the collected information suggests that the emotion of happiness has a direct link to better health. Here are the 5 most significant ways how the emotion of happiness improves health and life according to what most researches say. 1. Happiness protects the heart. In 2010, researchers conducted a study on how positive affect predicts cardiovascular health. Nearly 2,000 Canadians, were included in the health survey conducted in 1995. Participants talk about their anger and stress at work. Observations were rated on a 5-point scale depending on the extent of positive affectivity. After 10 years of follow-up, the researchers found that the risk of coronary heart disease was less likely to occur in happy people; and that a one-point increase in positive emotion is equivalent to a 22 percent of reduced heart disease risk. 2. Happiness enhances the immune system. Happiness is linked to a greater immune system and a reduced risk of cardiovascular disease. Happy people are reported to have greater marriage and job satisfaction. To prove that typically positive people are less likely to develop a disease, an experiment in 2003 was conducted where 350 adults volunteered to get exposed to the common cold. Researchers called them for an assessment of positive emotions such as happy, pleased, and relaxed, before exposure. After being quarantined for 5 days, the participants with the most positive emotions hardly developed a cold. Another study was done in 2006 where 81 graduate students were given the hepatitis B vaccine. After the first two doses, participants were assessed on the same positive emotions. The students with the most positive emotions displayed a high antibody response to the vaccine, showing a robust immune system. Happiness extends its work on a cellular level. 3. Happiness combats cortisol and stress. Happiness protects the brain from stress by releasing the protein Brain-Derived Neurotrophic Factor (BDNF) that protects and repairs the memory neurons while acting as a reset switch. This is what makes it possible for us to still be happy and at ease despite going through stressful moments. In 2009, researchers intentionally stressed out students to monitor how they respond to such situations. Led to a soundproof chamber, the students answered questions whether they generally felt 10 emotions such as enthusiasm or pride. To make it harder, they were asked difficult statistics questions while being videotaped and told their professor was to evaluate their response. The process involved measuring their heart through electrocardiogram (EKG) machine and blood pressure monitor. The happiest students recovered more quickly from the wake of the stress. Neuroscientists discovered that cheerful and optimistic people have higher activity occurring in their left prefrontal cortex (PFC). This side of the brain is associated with cognitive behavior, self-expression, decision-making and the person’s will to live. A study in 2005 found that women with more positive emotions, who are suffering from arthritis and chronic pain, didn’t experience an increase in the amount of pain. 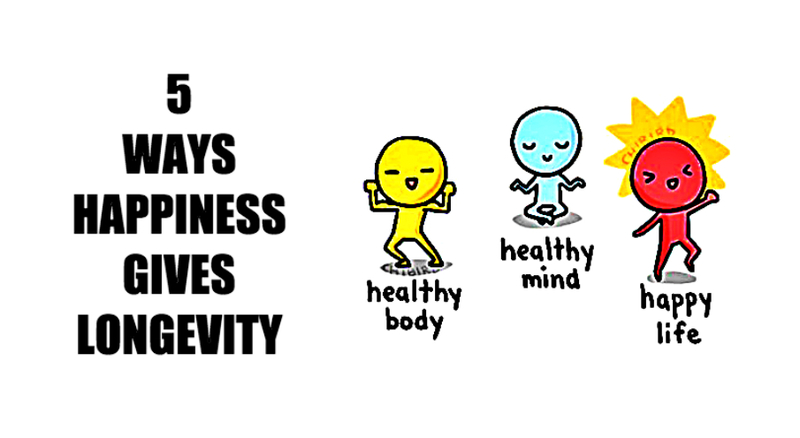 Happiness certainly plays an important role in the ultimate health indicator: longevity. A study to prove the link between happiness and longevity was conducted in the life expectancy of Catholic nuns. These nuns wrote an autobiographical essay upon their entrance to the convent life in their early 20’s. Researchers went through these writing samples to find positive emotions like contentment, gratitude, and love. The happiest nuns lived 7 to 10 years longer compared to those who are less happy. Another study conducted in 2011 reported that among 4,000 English participants, the happier ones were 35 percent less likely to die over the course of 5 years compared to the unhappy ones.